The Government could have closed the SAITM if it was not concernend about the students’ grievances, on the very first day that the protest began in 2015, President Maithripala Sirisena said yesterday. The President added that the government needed to secure the future of the SAITM students since they too are children of our nation. “I am very happy that the students’ future was guaranteed by absorbing them to the Kotelawala Defence University Medical Faculty,” President Sirisena said. The President also said that he personally got involved in finding a solution to this matter in a manner that no other leader had been involved. President Sirisena was addressing SAITM students and their parents at the Nelum Pokuna Theatre yesterday on the absorption of students to the KDU. 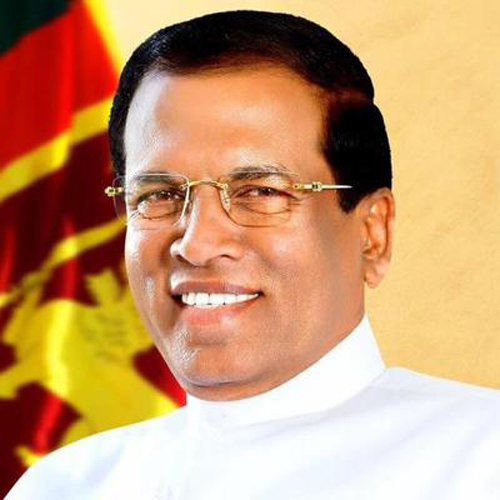 The President further said that while many protests were held for three years against the SAITM, it was he who held the highest number of discussions to solve the issue. “I treated this matter as one of my own,” President Sirisena said. “A political leader can’t discriminate against students whether they study in government or private universities. I can relate to this issue as I was the Health Minister for five years,” the President said. President Sirisena said he knew as to who was behind the issue and where it was originated. The President added that as the former Health Minister, he helped make the SAITM a university with international standards. “But, when we came to power, the government medical students were brought on to the streets by certian parties with vested interests for political gains,” the President said. “We have been able to solve the issue in a constructive manner. I faced much criticism over this issue,” the President said. President Sirisena also said he discussed the matter with members of the Inter University Students Federation despite the objection of a number of politicians. “During the discussion, I told them that there are private universities in almost all other countries, to which they responded that in all those countries there are protests against private universities,” the President said. President Sirisena also said that the government has accepted the policy to improve private sector education, while improving State sector education. The President added that the facilities of the KDU too would be developed in due course, while the government will also take measures to monitor the quality of education at private schools and universities. Hogher Education and Cultural Affairs Minister Wijeyadasa Rajapakshe, Defence Secretary Kapila Waidyaratne, University Grants Commission Chairman Prof. Mohan de Silva and Kotelawala Defence University Vice Chancellor Rear Admiral J.J. Ranasinghe were also present. Great Blessings to H.E who solved the SAITM issue of created chaos of GMOA involving medical students, parents, IUSF and other TU. Former SLMC Karl Marx with deans and staff adding fuel, flew on their brooms on ley lines for the loot of the hard hit job agents against private medical education. Many who had tasted political power crave for it, whatever the cost of toppling current government will take. Contempt of court of GMOA head and verdict of violation of Medical Ordinance by former SLMC head, sums up the political performance of the star medical duo, now visible in political meetings. H.E made the inspired choice of a legally excellent Minister of Higher Education. If more excellent lawyers who do not worship mammon are put into positions of authority, there is no doubt that the freedom of justice and law and order will return to nation. If the GMOA Ex Co, positions which no doctor of integrity covets, returns to compassionate medicine away from political passion, we will have a healthy nation. We hope that KDU MBBS will move towards that goal.